*Where can i find the SharePoint Logs? *What are the SharePoint Logs ? *How can i find the correct ones ? Where can i find the SharePoint Logs? The ULS Logs are stored in %CommonProgramFiles%\Microsoft Shared\Web Server Extensions\14\LOGS\ Folder by default. But what is the folder has customized and changed for another path . How could you find correct path ? You can find the log location path under “Trace Log” section in Path Text Box. The ULS Logs are stored in %CommonProgramFiles%\Microsoft Shared\Web Server Extensions\12\LOGS\ Folder by default. When you open this folder you may face with different type of files are stored in. What are the SharePoint Logs ? The LOGS folder contains log files (.log), data files (.txt), and usage files (.usage). The file naming convention for a SharePoint trace log is the server name followed by a date and time stamp. SharePoint trace logs are created at regular intervals and whenever there is an IISRESET. 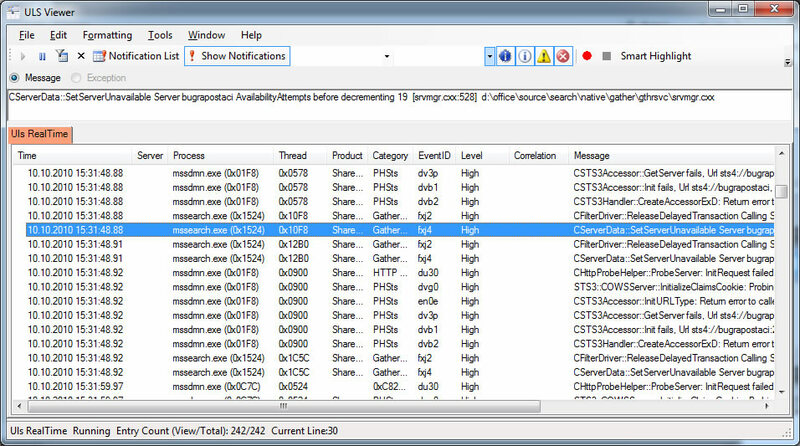 It is common to have many trace logs within a 24 hour period. Logs are in MACHINE NAME-DATE[YYYYMMDD]-TIME[HHMM].usage format. The Unified Logging Services (ULS) provides a single, centralized location for logging error and informational message related to SharePoint Server and SharePoint solutions.SharePoint 2010 includes improvements that are related to the management of the ULS and that make it easier for Administrator to troubleshoot issues. Logs are in MACHINE NAME-DATE[YYYYMMDD]-TIME[HHMM].log format. These logs are very important when troubleshooting issues on your system. And reqested usually by support engineers so do not delete this logs before getting backup . Logs are in PSCDiagnostics_MM_DD_YYYY_HH_MM_SS_SSS_randomnumber.log format. Upgrade status indicators and log files should give you an indication of what went wrong during the upgrade process. We recommend that you carefully review all the errors that were logged in the upgrade log files. Warnings might not always indicate an issue, but you should review them all to determine whether any of them are likely to cause even more issues. How could you find correct SharePoint ULS Log files ? When working with Microsoft , the support engineer may request that logs from you. But sometimes the log size can be huge. For example you have 8 server and 1 day logs for all servers can be tens of gigabytes .the important part in that log files that your issue’s reproduced time slice. So How could you find correct log files. you have 8 server farm and facing with incremental crawl problem . The crawl has taken 30 minutes and SE requested that ULS logs for all your servers. And you know that the crawl start time is 11:25 and finish time is 11:55 . the correct files are highlighted. you should get all ULS logs with explained method from all required servers (in this scenario for all servers) and it would be better to compress these files to a single zip file and than you can upload these logs to workspace that provided by Microsoft. Sharepoint logs is one of the important point for developers . When an error occures you may want to examine sharepoint logs in drive:\Program Files\Common Files\Microsoft Shared\Web Server Extentions\[12,14]\Logs.These log files are text based and sometimes its make me creazy for searching related data .Because its hard to find some thing in these texts files. There are some tools for easily manage your logs. Toggle Correlation Tree and Notification features are most i like.In SharePoint 2010 has come with new error handling feature named “correlation id” which is help us to trace a series of event inside SharePoint.